Annie: 00:00 This is join us in France, episode 191. Bonjour, I’m Annie, and join us in France is the podcast where we talk about France. 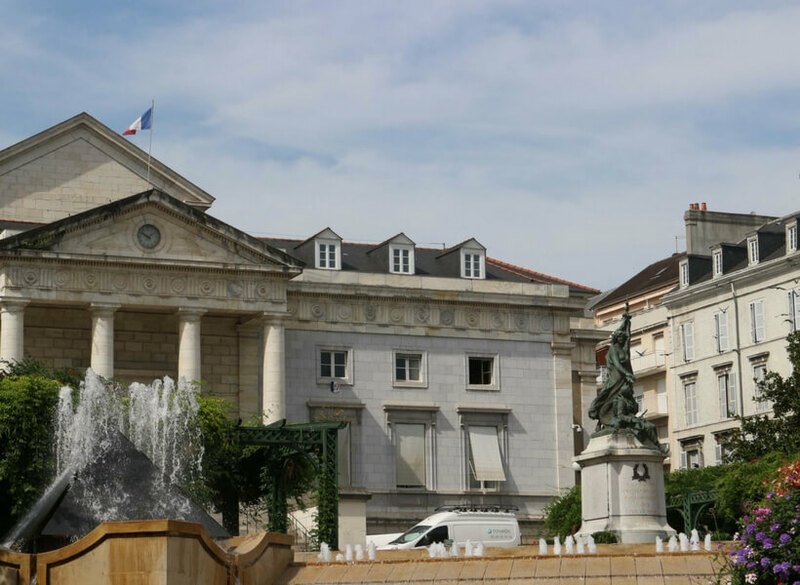 It’s many quirks, its history, its language, and of course destinations in France you want to learn about because hopefully you will be visiting soon. 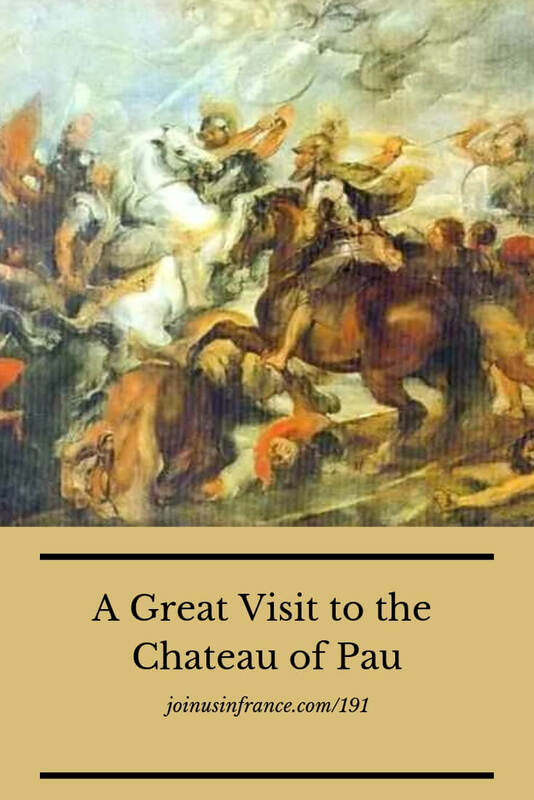 On today’s episode, Elyse and I talk about the lovely city of Pau, that’s spelled p a u, where you can see the famous chateau of Henry IV, a most interesting and unusual French king. Pau is in the southwest of France. Not too far from Bordeaux, in the Nouvelle Aquitaine region. Annie: 00:42 You should listen to this episode because, even if you don’t have immediate plans to visit Pau, Henry IV is an amazing French king, and you’ll learn lots of things about French chateaus that apply to any chateau in France. I’m always happy to see that people listen to episodes that don’t have to do with Paris because the only way you’re going to get to know France is to look at many parts of France. Annie: 01:10 Join us in France is brought to you by Patreon supporters and Addicted to France, the small group Tour Company for people who want to enjoy France to the fullest with zero stress. 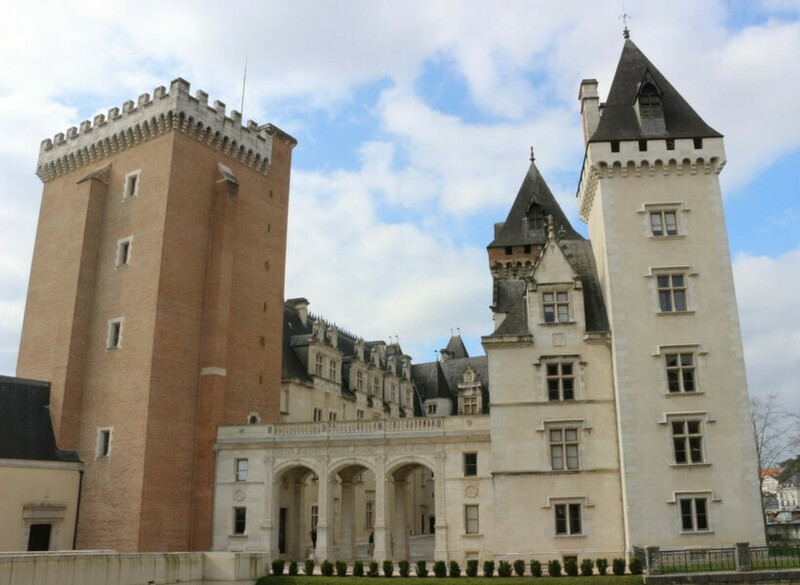 Check out our upcoming tours in May 2018 on https:addictedtofrance.com. Annie: 01:10 Hello Elyse, welcome back! Elyse: 01:10 Thank you, Annie. Annie: 01:10 How are you? Elyse: 01:10 I’m good. We have some sun and we feel better! Annie: 02:07 Yes! We’re happy. We’re sorry to hear about all the… We’re, we’re recording this uh, late January 2018, and we keep hearing about people in America getting really cold weather. Elyse: 02:19 Yes, floods, there are floods actually in a lot of places. Unfortunately. Annie: 02:22 And people in Australia are getting really hot weather. Here, we’re just right in the southwest of France. We’re fine. And we’re staying in the southwest of France today. Talking about Henry IV and his castle in Pau. P a u, short little town name. Elyse: 02:46 Henry IV was a one of France’s Kings. 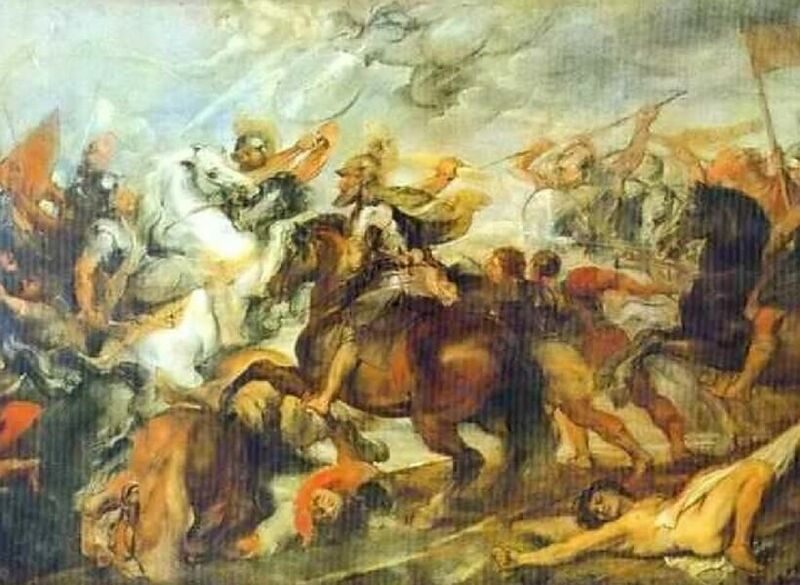 He was in fact the father of the dynasty that produced all the Louis, Louis, Louis and Louis came after and he was born in the town of Pau, which was for centuries, the capital of a little kingdom that’s actually in the Pyrenees, and it’s the Kingdom of Béarn. Annie: 02:46 Oh, very good. Elyse: 03:08 Very nice little name Béarn. When he was born, and I think for quite a long time afterwards, you know, the people in that area, they were part of the people who spoke Occitan, not French. So this is another little world apart from the people up north in Paris. Annie: 03:27 So he was probably raised in Occitan. Elyse: 03:27 He was raised in Occitan. Annie: 03:27 It was probably his first language. Elyse: 03:37 Although,as a child. Just very briefly, just to mention that, since he was of royal blood, he was actually sent by his parents to Paris at the age of about five and spent a few years in the court because he was a cousin of the kings. Elyse: 03:49 And so he most likely became bilingual. But let’s, let’s talk about Pau and the castle because it’s a wonderful, fun place to visit. 200 kilometers from Toulouse. Elyse: 04:01 Just to a good two hour car drive. You can take the train if you wish. Takes you to Pau. Pau is a small city perched on top of a big hill. And uh, it’s above a river called the Gave of Pau. And Gave, g a v e is actually a word in old Occitan, which means a river of melted snow waters that runs very fast. Annie: 04:27 Oh, wow. Means all that! Elyse: 04:30 All that, yes that it means all that. It’s apparently a word that’s used only in the southwest of France. A, it’s still used today. They don’t call it a river. They call it a “gave”. Annie: 04:30 OK. Yep. I’ve heard that actually, yes. Annie: 04:42 C’est “le gave” ou “la gave”? Elyse: 04:42 You’re asking me? Annie: 04:46 Who cares, anyway! Elyse: 04:53 Who cares, right! affairs. And um, uh, the castle that Henry IV was born in, he was born on the 13th of December 1552. Dead “milieu” of… Smack in the middle of the sixteenth century. Uh, at a time when France was living through lots of turmoil. And we’ll talk about that another time. Uh, that is the wars of religion. Elyse: 05:19 His parents were both of royal blood. His mother Jeanne d’Albret. Elyse: 05:58 Jeanne, yeah. Yeah. In English it would be “Jean” like Jeanne Moreau. She was the granddaughter of François I. So this is both on both sides of his family have royal blood, and he was born in this castle that had originally been built 500 years earlier as a wooden fortification up on top of this hill to protect from invasion because people would follow this river and the path that it created. It was kind of a natural path. East and west created basically a by the Romans, ancient, ancient times before. Elyse: 06:07 And so, uh, in order not to worry about the invasion by the English, or by the other Counts and Lords coming from the east. Annie: 06:18 Right, because Lourdes isn’t far away from Pau. Elyse: 06:21 Lourdes is not far away. In order to really have this kingdom, imagine in the era of about 1000, when there were invasions all the time coming from every direction. Uh, they built this. What originally was all wooden, a fortified castle. Annie: 06:37 So, “po” like “pilotis” or something. Elyse: 07:00 Exactly. And that apparently was that came first. The town was built around it, and simply became known as Pau. Elyse: 07:23 A castle is more fortified. Yes, it’s fortified. The castles basically became chateaus in the time of the 1500s, in the renaissance because they no longer felt they needed to have all these walls around and stuff. Annie: 07:23 The protection stuff was not so important. Elyse: 07:48 You can do both in the same day. Elyse: 08:18 You go into Basque Country. , you’re not the boss country. Annie: 08:19 You’re not very far from Basque country and it would make sense as a visitor today to visit those together. Yes, because they’re so close. Elyse: 08:27 Because they’re so close. So the, the castle was originally a fortification. It had, uh, several different vicounts: the vicounts of Bearn, who were actually the original royalty of the area. And for many, many, many years, for several centuries, it was a separate little kingdom. In fact, what’s interesting is that in the history of the south west of France, more than in the southeast, is that there were lots of separate, teeny little kingdoms that were basically attached to the Pyrenees mountains. Elyse: 08:59 And because they were relatively isolated. Probably. That’s one of the reasons they managed to stay independent for a very long time. They were not annexed, because they were not priority. Let’s face it, you know, in terms of wars and annexation and things like that. So what you have is a, some of the illustrious ancestors of Henry IV, uh, the most famous is a, someone the count a Gaston Phoebus. Elyse: 09:30 Who was the, a count of a Foix and Pau at the same time. Annie: 09:37 OK. That’s another city that’s another city that’s not so far. Elyse: 09:37 It’s much further east. Annie: 09:37 And it’s kinda hard to drive between Foix and Lourdes. Annie: 09:45 Today I mean. Elyse: 09:53 He took this old wooden castle and turned it into, what was the time, we’re talking 1300s, a modern stone castle. He added a tower that is a 33 meters high, which is very, very high. He added another wing to the castle. He used brick and stone. So a good part of the castle that exists today is actually from that time that is from the, uh, end of the 14th century. Because obviously by that time you modernized, you know, you added things that were not in existence in the year 1000. Elyse: 10:30 And obviously one of the dangers of a wooden castle is that it can burn. And they did, very often. So what happens is that over the time the castle was added to a revised in terms of the materials and a good part of what we see today. Basically half of it is from that time period between the 1400s and the 1500s. And the other part of what exists today is in fact restoration and rebuilding other nineteenth century, which is something we’ve talked about a lot of other places. Annie: 11:04 So it’s been renovated. Elyse: 11:04 It’s been renovated. Annie: 11:04 Was it Violet le Duc that did it or somebody else? Elyse: 11:10 No, no. It was somebody else. But, but if he didn’t, I doubt if he would’ve thought it important enough to be honest. I’m not even sure he had his own version of priorities, you know. By the time we get to, uh, the middle of the 1500s, it is the seat of a powerful little kingdom that interestingly enough is coveted by the French king, by the English king and by the kingdoms in Spain on the other side of the mountains. But because of its isolation and you, when you drive there, you see it’s really fairly isolated. There are things not too far away. 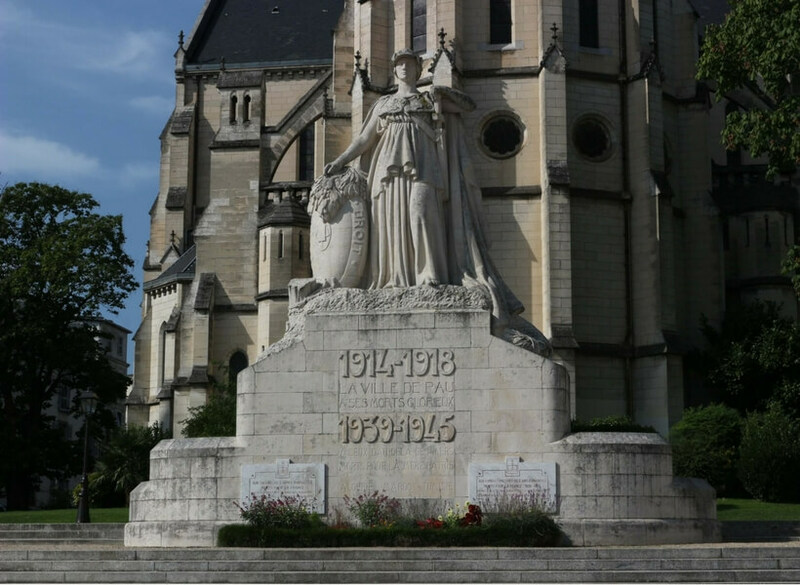 Tarbes is not too far away, Lourdes is not too far away. But, um, it was able to protect itself. So they were able with the fortifications and two sets of walls around the castle to make sure that nobody ever invaded them. Elyse: 12:03 And that is really what… that’s what happened. They never were invaded when they were finally taken over, it was through a marriage and a political negotiations and alliances of that kind. So Henry IV was born in this castle. His mom, uh, Jeanne d’Albrey and his father Antoine de Bourbon. They were both have of royal blood. He was a cousin of the kings of France. Annie: 12:31 OK. And she was a granddaughter of François I.
. Yeah. So, there were other children that came after, but he was definitely going to be the one who would become king of this small kingdom. So two things happened. One is that his mother was a calvinist or Protestant at a time in the middle of the sixteenth century when a good proportion of the people in France were going to this new, what they call in French reformed religion. Elyse: 13:49 Paternal grandfather, yeah. Who was someone who really believed that his grandson should stay as a separate king of the separate kingdom. He didn’t want this annexation, uh, with, with the north, but he was a traditionalist of customs from the Pyrenees. And so at his birth now at his birth, I’m, this could have been when he was two days old, this could have been when he was two weeks old. Annie: 14:48 Which is is good wine. I don’t agree with the garlic, but the wine is good. Elyse: 14:52 He had him breathe in the fumes of the wine. Now, they say this is that his birth. I’m assuming that this could’ve been a week or two old and this is a tradition. Elyse: 15:05 This is an ancient tradition that apparently continued on for a very long time because the belief was that by having the garlic rubbed on his lips and having breathing in the the vapors of the wine, he would have good health. Annie: 15:25 Good health?! OK, well good health. At least he didn’t make him drink the wine. Elyse: 15:29 No, but apparently the story is, and since we know by many, many, many, many documents that Henry IV was among other things, a real ladies man and had two or three mistresses that were really important in his life. One of them wrote and said that when she first met him, and this is of course later on when he’s an adult and he’s a powerful man and then of course when he’s King of France, that uh, he made advances towards her and she couldn’t stand it because he reeked of garlic. Elyse: 16:02 So obviously the traditional garlic stayed with him! Annie: 16:02 The garlicky king! Elyse: 16:11 The good garlicky king, you know, in that order. So what happened was that the castle in Pau was, basically became a second residence for him. Because he spent so much of his time going back and forth between Paris, where he was basically a invited to be part of the court since he was, of course, of royal birth and Pau, because it was the center of this Kingdom of Béarn. And then, uh, at the age of 19 “he was married off to”, and we really have to put it in those terms because it was definitely something he did not want. Annie: 16:50 It was arranged. Elyse: 16:51 And it was not even something that, uh, his mother particularly wanted. Uh, but his mother was part of a very, very influential branch of the royal family, and a good number of these people had converted to protestantism. And so in order to try and make an alliance that would keep the country from going into civil war—which unfortunately did not prevent this from happening—he was married off to a cousin of his. Elyse: 17:26 She was, clearly probably a second-degree cousin or something like that. And that is Margaret de Valois who was a sister of the king. The king had, two brothers and a sister. Annie: 17:40 Which king are you talking about here? Elyse: 17:41 We are talking about Henry II. His brother was designated as Henry III, the Henry II died very suddenly. And then Henry III became king. And then when Henry III died, the next in line in order in terms of the laws of what they call a salic laws, which means the laws of royal blood. The next in line turned out to be Henry IV. 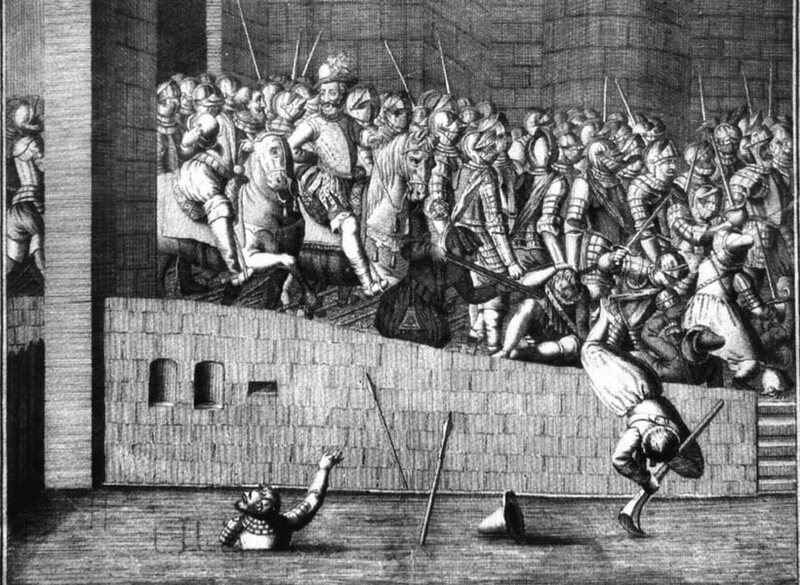 Elyse: 18:21 He just wanted to be the king of Béarn. Elyse: 19:01 He was both a good warrior, and, uh, he was actually a very cultivated person, but of course he was from the south. So he heard certain as far as the people from the north and Paris and certain disadvantages. Elyse: 19:01 He probably had a wicked accent. Annie: 19:47 He is like 30 something? Elyse: 19:51 He’s 37, 36, 37. And we know that, he was king from 1589 until his assassination in Paris in 1610. Elyse: 20:09 And then it is of course his son Louis the 13th, who becomes king. So what happens to this castle? This castle during this period of time is basically used by his soldiers. It’s still considered to be important from a defensive point of view, but not nearly as important before. And by distant relatives who of course are all members of the royal entourage. And it’s his son Louis the 13th, who in year 1620. So this is 10 years after Henry IV dies. Annie: 20:43 So Louis the 13th is already the king? Elyse: 20:49 He’s already the king. He was a minor when his father is assassinated. His mother, Catherine de Medici becomes regent. The differences were enormous in mentality, personality and every other way between Henry IV and his son Louis the 13th. Louis the 13th, becomes a very conservative, very orthodox Catholic, and wants to bring Catholicism back to a country that Henry IV had opened up so that there was freedom of religion for both Protestants and Catholics will do this as another episode. We’ll talk about the wars of religion. Elyse: 21:19 But what happens interestingly enough is that Louis the 13th, who is the one responsible for the beginning of the versailles becoming a chateau. 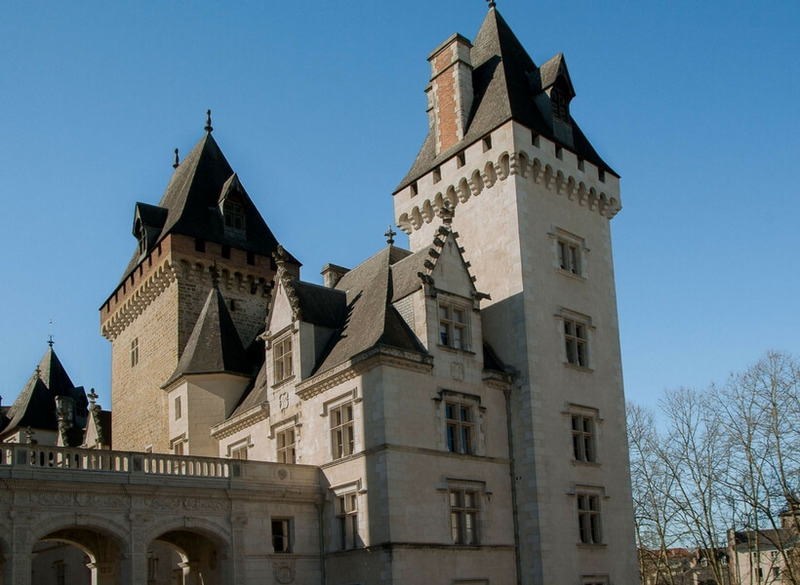 He goes down to Béarn, to Pau and visits this castle, which is his, by heritage. And decides to fix it up a little bit. And he, because he was a king who traveled all the time, he decides to turn it into some place more comfortable. And so he, brings in a builder’s and he brings in furniture on tapestry and all of these things from the north and he has the castle redone. We can consider it to be redone. And so under his reign, which takes us into, of course, the middle of the 1600s, the castle becomes a much more up to date place and more comfortable place. Annie: 22:16 Less of a castle and more of a chateau, maybe? Elyse: 22:19 Exactly, exactly. The fortifications are no longer really necessary, but they are kept there for quite a while. 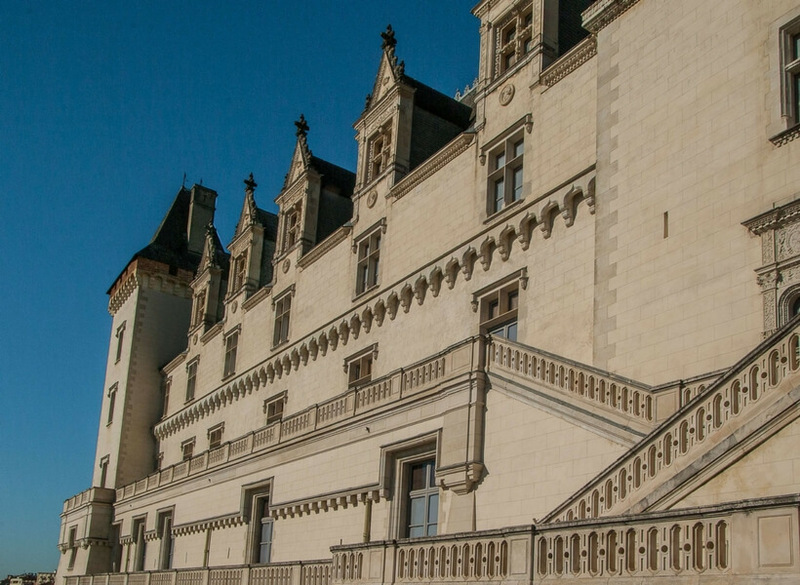 And what happens is that he gives custody of the chateau to be taken care of by a noble family. The family called the Gramont family. Annie: 22:19 Well, that’s a local name. Lots of things are called Gramont around here. Annie: 22:40 Yeah, cathedrals too. 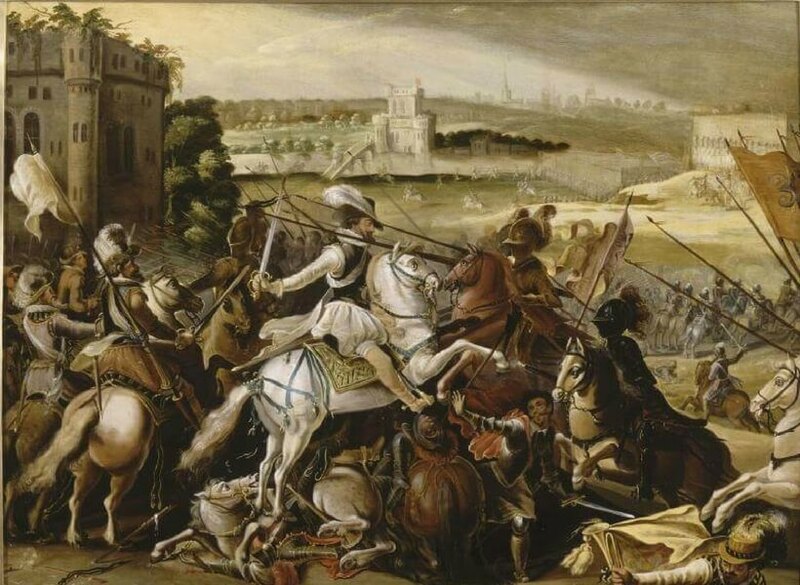 Elyse: 23:14 Was taken over as an outpost for the army because, with a revolution of they are worried about, of course the soldiers and the king of Spain who are coming up from, from the south. And the English coming from the west. And everybody’s trying to stop this Revolution anyway. So the castle is taken over by the military. And once the revolution has calmed down, because in the southwest it was important, but not nearly as important as in the north. And once the revolutionary spirit has disappeared, you have the restoration of the monarchy under Louis Philippe. And Louis Philippe is a cousin of Louis XVI. Elyse: 24:01 And Louis Philippe decides that he really likes this castle. Elyse: 24:05 In Pau. I don’t know exactly why, but he decides that he really, really likes it. And so what does he do? Annie: 24:05 It’s a beautiful area! Elyse: 24:13 Not only were there pieces of furniture and tapestry brought from the from the north, but he has pieces remade. And he decides that the castle in Pau is a perfect example of a southern Renaissance castle. And so one of the things, of course that we’ve talked about a little bit, but it’s very interesting about the nineteenth century, is that there’s this spirit of replication. Of replication, of ancient Gothic, of ancient renaissance, of ancient everything. So he takes the royal manufacturers for furniture and tapestry and has them reproduce in an identical way pieces of furniture and tapestry from the renaissance. Elyse: 24:58 And he has them brought to the castle and Pau. Annie: 25:02 So that’s… is that what we see today? Elyse: 25:03 That is a lot of what we see today. Now, there are two things that are theoretically, hypothetically, from the time of Henry IV. One is his cradle. His cradle was a tortoise shell. And it’s famous in history because it was his grandfather again, there’s this famous grandfather who had his lips rubbed with garlic as a newborn baby. Elyse: 25:30 Who said, among other things, that in order to be strong and a warrior, he should have this to sleep in. I don’t know what the reason is for. There has to be some kind of symbolic reasons, but it is a huge, huge tortoise shell that became his cradle and that is what you can still see when you go to the castle in Pau. And his room now, the furniture to my disappointment, I thought was the authentic original furniture. Elyse: 25:57 One of the things you see as the four poster bed where he slept when he did visit the castle. That is Henry IV we’re still talking about. And one of the things you notice very, very quickly is that it’s a very short bed. Now, most people assume when you see beds like this, which are typical of beds that you would see in in Renaissance Chateau, and we can call it a castle and then it became a chateau, are that the people were very small. But that is not why! It is because people slept sitting up! With pillows behind their back on an inclined because it was believed and it was believed for centuries and centuries and centuries. That if you slept completely flat on your back, you would suffocate. Elyse: 26:45 It’s true. This is what they did! Annie: 26:50 They could have tested that theory you know! Elyse: 26:52 They, they could have, they probably could have. Elyse: 27:09 Are so short. It’s because they would have all of these wonderful pillows and they would sleep on an incline with pillows. Annie: 27:09 Well, I’m good with pillows, but… lying down is good sometimes! Elyse: 27:18 But the other thing is, and this has to do not so much with the castle as what the furniture is, that even though it was a refurbished with a lot of furniture, that was a theoretically from the renaissance and some pieces that were recuperated that are genuinely from the renaissance. One of the other things is that now, you know, to the beds, the beds from that time were basically like a double bed today. Certainly at the, at the largest, at the widest. Elyse: 27:49 But because the building itself, even though there was all this beautiful tapestry and furniture from the renaissance, the building itself was still a building that in structure was largely feudal. So it was not a building that had a lot of heating even though it had this huge hearths and you know fireplaces. People never slept alone. Elyse: 28:08 And even the king, not necessarily with just his latest mistress or wife, but sometimes an honored invited person would be invited to actually sleep clothed in the bed with a king. Annie: 28:08 With the king? Elyse: 28:28 With the king. And this was, this was so that they would stay warm. Annie: 28:31 I guess that make sense. I mean, if there’s more people in the bed, you don’t get so cold I guess. Annie: 28:40 But it’s a tiny bed we wouldn’t be comfortable nowadays like that… That’s not how we roll. Elyse: 28:46 No, it sounds a little suspicious to me anyway, you know. I’m not really sure about this. But so Louis Phillipe a starting basically, in the 1830, did what can be considered to be almost a complete restoration of furniture and of the tapestries and they are still there when you visit it. One of the things that’s nice visiting this castle, you have this huge courtyard when you enter in, you have a view that spectacular over the Gave, the river down below and on a clear day of the mountains south, which of course is the high Pyrenees. It’s really quite lovely. Elyse: 29:25 And then we have a napoleon the third who came after Louis Philippe. Elyse: 29:34 And what he did was he did structural renovation. Elyse: 29:39 So one of them did a furniture and interior decoration, renovation on the other one, did some structural renovation and he added a couple of pieces and a tower in the spirit of someone like Violet le Duc, thinking that this was what it probably looked like in the renaissance, but he added his own little touch to it. Elyse: 30:04 And, after France finally, ultimately became a republic, the building was pretty much left, intact but empty with some caretakers. And it was in the end of the nineteenth century that they started to talk about making it into a historical monument. And it became a historical monument, but it became the castle known as Henry IV castle, and his museum in 1929. Elyse: 30:32 So it was his castle. It was really associated with him and his life and the story of all of that. But it was only in 1929 that it officially became known as the Henry IV Castle Museum. And that’s what it is today. It’s open every day of the year, except for the first of May, which is our Labor Day here, Christmas Day and New Year’s Day. Elyse: 30:55 And it’s a lovely fun place to visit because it’s not just the structure of the building, but you, you see it and you see all these beautiful furnishings on the inside. It’s kind of neat. And of course had certain times of the year, like in the summer, like many of these other castles, particularly in the south, they have exhibits of things. Annie: 30:55 Right. Special exhibits. Elyse: 31:15 There’s a special exhibit, there’s a little bookstore they have, they have all kinds of things. So it’s a wonderful place to visit and gives you a sense of, the history of these little what were really separate kingdoms until really the sixteenth century. Elyse: 31:47 There were. But more it was alliances. Annie: 31:56 He could have, I mean it was his! Annie: 32:12 And he was king of Béarn. Elyse: 32:16 But for some reason officially it wasn’t made part of the Kingdom of France until his son Louis the 13th declared that it was part of his possessions. Annie: 32:40 Right. Which department is that? Elyse: 32:40 It’s… I think it’s Hautes Pyrenees. Elyse: 32:40 It’s the administrative center. Annie: 32:40 Non, Pyrénées Atlantiques. Elyse: 33:10 It’s like the county seat. Annie: 33:27 Right… des Pyrénées Atlantiques. So it’s the biggest city. It’s the biggest city in the area of as far as that department is concerned. Elyse: 33:32 Because it’s a fairly rural area. To the south, the city is literally, it’s rather spectacular… If you go by train, which I’ve done twice, the train station is down below, along the river bed, not in the river, but right next to it! And you… the castle is up above all of the city is pretty much up and you have to either walk it or there’s this, a kind of mono rail thing that will take you up. Or You could take a bus, obviously. Annie: 33:32 A monorail, eh? Elyse: 34:01 Yeah, there’s a kind of monorail. Annie: 34:04 I haven’t been in so long. Elyse: 34:05 It’s rather spectacular. So if you’re up above on a nice day, you have a view that’s fabulous of the Pyrenees with snow on top of it. Even in the summertime you can get to see some stills there, still some snow in the high Pyrenees. And it’s rural in the area around there and it’s got a small university. A lot of people go there for a couple of years and then finish off by coming to Toulouse or Bordeaux because it doesn’t have a big university. Annie: 34:33 I actually know several people who went to the…. So they have an engineering school. So when they have one of these, um, Prépa intégrée, engineering school, so that’s a very French thing, you know, it’s a prep school plus engineering school. So they take the kids from, you know, right after their baccalaureate for five years. And they come out with a Master 1. Anyway, doesn’t matter to visitors that doesn’t matter. But I know a few people who’ve sent their kids there, yeah. Annie: 35:06 How long would you spend there? Elyse: 35:17 Well, I would, I like going there. I been, when I’ve gone there actually, uh, I like having lunch there. Don’t ask me why. I like the food there. It’s very much the Gascon food, you know. And they have lots of nice little restaurants. Elyse: 35:30 Duck, but also they have a lots of things. Of course with duck they also have a couple of other dishes that are really local kinds of dishes. And then that soup, the Garbure, garbage area, which is very typical of that area if you’re a… It’s kind of like an enormous stew thing with beans and vegetables and meat of course. Elyse: 35:30 Garbure: G A R B U R E.
Annie: 35:55 You know I’ve heard of that, but I don’t know if I’ve ever had it. Elyse: 35:57 It’s delicious. Of course it’s not something to have in the summertime. You don’t want to eat that in the summer. You would just sink into the Gave, you know without any problem, you know. But it’s a lovely little city to walk around. I would say if you do a visit to the castle, the visit to the castle is probably an hour and a half at the most. And then a walk around town. If you just want to do a quick walk around, take a look into some of the old buildings and see maybe it’s a two and a half hour stop. If you have lunch, it’s more, right, so it’s half a day, you know. Annie: 36:30 So, can you do it as a day trip from Toulouse? Elyse: 36:35 Absolutely. It depends how much driving you want to do it. If you want to you can do that. 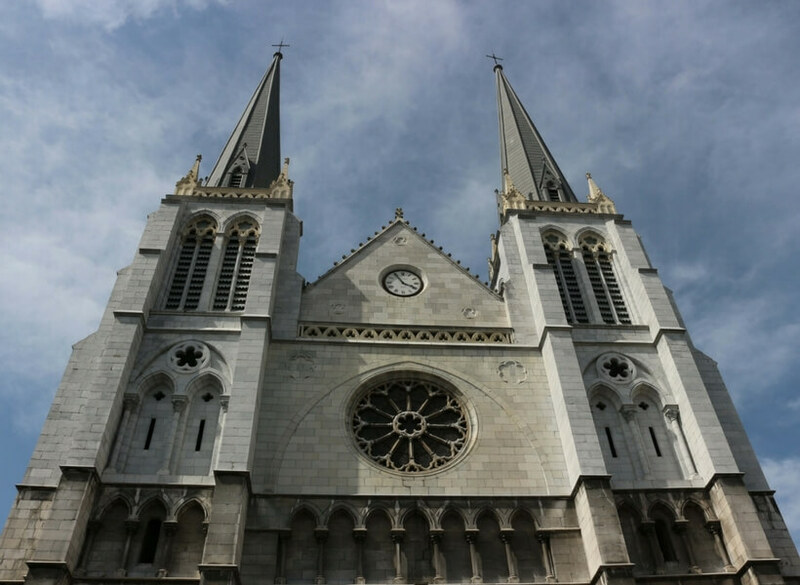 And if you are curious or interested in going to Lourdes as you mentioned, you can do those as each one a half a day type thing because they’re… it’s a fair… It’s a two hour drive. It’s a good steady two hours on the “autoroute” drive. Annie: 36:52 It would make for a long day though. If you leave Toulouse at eight in the morning, two hours to drive to Lourdes or a little less maybe. And then what? To see the Lourdes what? Elyse: 37:06 You go to the Grotto and then there’s even actually a very interesting ethnological museum in Lord. But you can do them… I’ve done them separately and I’ve done them together. I did it together, both Lourdes and Pau with a couple of clients. I’ve done it myself going to Pau, just visiting Pau, but if you are interested in going to Pau, it’s also very nice. There are a couple of nice little stops in the countryside along there that you can do. And if the weather’s nice you can even picnic outside of Pau if you want because the river is very beautiful and there’s forests and hills and, and, and things like that. So you can actually combine going to the city, which is still a city, even if it’s small. There’s a part of it that’s now, of course, built up down below. So it’s a fairly bustling tiny little city, but it’s 20 to 30,000. I’m not sure how many people are in there. What is it? Elyse: 38:03 I’m sorry, Pau, excuse me. Oh yeah. That’s because it’s expanded obviously. But it’s a nice a venture into the… that area which is heading into the southwest. As you mentioned earlier, if people are interested in going to Basque country, which is very beautiful and we can talk about some more, it’s a great thing to do as a two, three day trip. You start by going to Pau and then keep going a little further west. Annie: 38:03 To the Basque country. Elyse: 38:33 To the Basque Country. And that’s also a nice thing to do. Otherwise it’s up to the, you know, people, some people don’t mind doing a long drive and not staying long time and a place. I’m more of a leisurely. Yeah, take it easy. Take it. Yeah. Annie: 38:46 I want to caution people. It looks on the map like Foix and Lourdes and Pau are all aligned that they’re close, but when you’re driving they’re not. Because if you are driving between Foix and Pau, you have to go across the Parc Naturel Régional des Pyrénées, and that’s just very, very small roads. So it’s going to be a two lane road. You’re going to go through every little village. There’s going to be lots of twists and turns. Hilly. It’s not a drive I would recommend to foreigners who are not used to French roads. Elyse: 38:46 Whereas the road to Pau is “autoroutes”. Annie: 38:46 Right, between Toulouse and Pau you have a freeway. So you could do Toulouse, Tarbes, Lourdes, Pau, all of that is on the freeway. Elyse: 39:46 And the drive from Pau to Lourdes is very beautiful, but it’s more of a sinuous drive on small departmental roads. Annie: 39:49 Well, let me take a look at that because I haven’t. So if you are going to do both, Lourdes and Pau, Lourdes is a little bit off the freeway, but you get freeway almost all the way to Tarbes. And then you get off the freeway to go to get to Lourdes. And then you get back on the freeway and go to Pau. So that’s fairly simple drive. Um, but from Foix it’s just not, no, I wouldn’t recommend it. Elyse: 40:39 But it’s a very nice area. It’s very green. It’s got a lot of nature around it and the city of Pau is a city I happen to like. It’s interesting, I didn’t realize it was now up to 70 something thousand people. Uh, but I liked it. It’s very pretty. It’s a part of it that’s built up right above where the train station is, was you can see is very much 19 century rebuilt in the style of the promenades, like in Nice and things like that because it has all of these terraces and wide promenades that look out south on the Pyrenees. So it’s very, very beautiful and it has an old medieval center. So I like it. Annie: 41:20 Yeah, it’s a nice place to spend a day and it’s one of these towns. I know a lot of people find the show because they’re thinking about moving to France. It’s one of these cities in France that’s not super famous. And so I suspect it would be a nice, um, for some people it would be perfect because it’s not too tiny. Uh, it’s not too big. It’s not too expensive, you know, it’s, it’s one of these really nice little towns that we have in the southwest, but it is not Paris. I mean don’t expect to have like life is very slow in the southwest and because we like to take our time. I mean Paris is more… Toulouse is more of a happening place in the southwest. But are these places, you know, there’s not going to be lots and lots of tourists. Elyse: 42:21 But it’s, you know, Pau is typical place where it has a little bit of everything and in the summer time has some music festivals, has things like that. This is, of course, the wonderful thing about visiting starting in June, going into the end of September, is that you have theater and music festivals pretty much everywhere. And of course, uh, you, what you have there is the, I’m not sure how high up it is, but it’s nice. The air is nice. It’s not, there’s no industry. Very, very, very close to the city. Just there are other things that are not that far, but right there. Yeah, it’s kind of healthy. Annie: 42:56 Lovely place. We recommend it and if you want to come visit you can have a tour with Elyse, obviously and or you could do it by yourself, but really it’s off the beaten track, but we think it’s a lovely place off the beaten track. Elyse: 43:11 And we’ll talk more about Henry IV, about architecture and the renaissance and the wars of religion on another podcast. Elyse: 43:38 Because he’s responsible for many things you have or will see in Paris and don’t know that. Annie: 43:42 That’s right. And uh, yeah. So we’ll get back to Henri IV. We just wanted to touch on this one aspect of his life in the southwest as a, as a southwest kid myself. Elyse: 43:55 And just one last thing that has to do with Toulouse and Henry the fourth. We have the privilege of having in Toulouse the only statue that he ever posed for while he was alive. That is a statue that you can see when you go to the Capitol Square in Toulouse because Toulouse was one of his favorites. Annie: 43:55 Of course it is! All right Elyse, thank you very much! Elyse: 43:55 You are welcome Annie! Annie: 44:22 And we will talk to you next week. Annie: 44:30 Thank you Lynda Pearson, Jennifer Miller, and Dawn Davis for pledging to support this show on Patreon this week and my thanks also to all the other patrons who support the show month after month. Thank you for giving back to support the show on Patreon. Go to patreon.com/joinus. And you guys rock, thank you. Annie: 44:59 For my personal update this week. I have been hanging out with an 11 month old black labrador puppy over the weekend. He’s in training to become a guide dog for the blind, but I’m not training him. I’m just a host family, I guess you call it “famille relai” is what we call it in French. Uh, his regular family went away for the Easter weekend and I volunteer to take care of him, which I do regularly these days. He has been a delight. He’s really well behaved. He loves our walks and he jumps in all the puddles with gusto and he doesn’t complain when I rub him down and force him to stay on the mat inside, you know, by the front door while he dries off. Annie: 45:47 Uh, it’s amazing how much joy I get out of simple walks in the countryside with a dog. I love walking no matter what. And I do it with or without a dog, but with a dog, it’s so much better. And because I’m recording this on Easter Monday, which is a holiday in France, we saw a lot of relaxed, happy families looking for chocolate eggs in their gardens and lots of people walking their dogs and we got lucky because it’s overcast, but it’s, the weather is nice, not windy. It’s lovely. Annie: 46:20 And I have to tell you a little secret about France. So shhhhhh, don’t repeat it, OK? 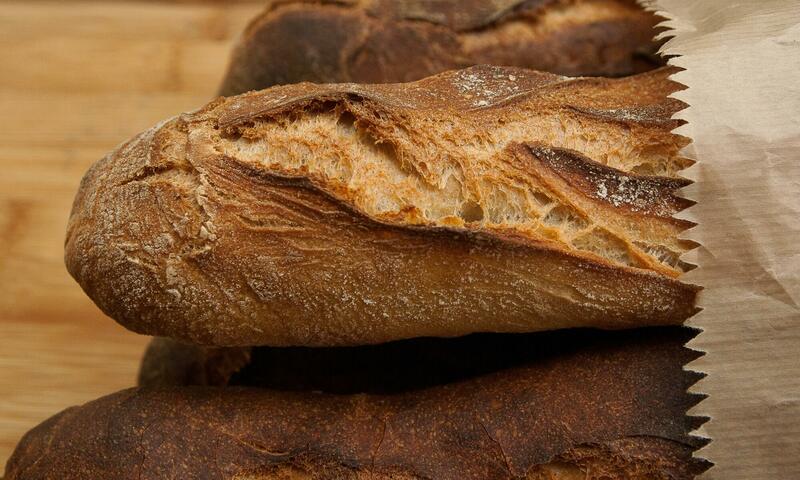 I often read that French people get fresh bread for breakfast every morning. Don’t hate me for popping your bubble. But everybody I know in France eats bread from the day before at breakfast. I know, the horrors! Well most mornings, unless it’s a weekend or a day off like today, the bakery was packed, today my village. We don’t have the time to get fresh bread from the bakery. And the only time you’ll see me at the bakery at 7:00 AM is when I ran out of bread. And there’s no bread in my freezer either. So yeah, in the morning I, and most of France, we eat bread from the day before that we toast. Annie: 47:15 Or even bread that we keep in the freezer. What French people eat frozen bread too? Oh, yes, we do! Sometimes I buy too much bread one day, like probably today I think I bought too much, so I slice it up and I put it in the freezer. Then someday when I miscalculate again, but in the other direction, I got two little bread. All I have to do is go get a bag of sliced frozen bread from my freezer, pop it in the toaster and we’re good to go for breakfast. Annie: 47:48 When you come to France, you can see this for yourself. The time of day when there are lines in front of the “boulangerie” is around noon, but even more so around six or 7:00 PM. When people come home from work. 7:00 AM on a weekday, no lines, so no, we don’t get fresh bread from a bakery every day in France. We get it later in the day and on weekends. Obviously bakeries are very busy on holiday weekends even more. New Speaker: 48:19 I have a favor to ask of you because the join us in France, closed group on facebook is so active and people are so engaged, Facebook automatically suggests the group to people who are interested in France, but they know nothing about the podcast. So a lot of people join the group and don’t know that it’s a podcast. I’d love your help in telling them about the podcast, maybe suggests an episode that was particularly helpful to you. Annie: 48:53 It’s getting easier and easier to listen to the podcast. We’re on Alexa, on Spotify, Google play music, Apple podcasts, and more. Obviously, you who are listening right now, you’ve figured out how to listen to podcasts for yourself, but maybe you could suggest one of those ways to somebody else. And thank you for helping me spread the good word. And of course it’s all free. So why not? Annie: 49:22 The rail strike is about to get underway tomorrow. Listen to episode 189 for strategies of how to get around France without using the train. The strike is going to be big. And other public service sector, uh, transportation companies are likely to join. Air France has already joined the strike for several days. The RATP, so that’s the metro system in Paris, is likely to join at some point as well. So if you’re coming to France this spring, I highly recommend you think about alternative modes of transportation. Annie: 50:05 At least learn about them, so you’re prepared. To learn about Uber in Paris, listen to episode 151. 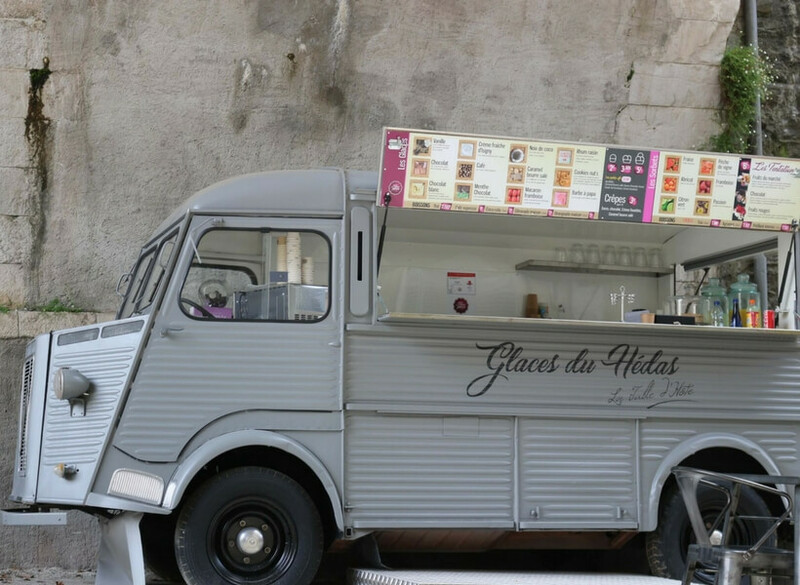 To learn about the bus in Paris, listen to episode 142. And about the regional buses in France, that was episode 75. The number of reservations on regional buses has tripled as a result of this rail strike. And companies like FlixBus, and Isilines (that’s spelled with i) are responding to the demand by adding more buses. So you also have a ride sharing sites such as BlaBlaCar. There are solutions you just need to get informed and make plans. Annie: 50:51 People love the email extras, especially the printables I send out to supplement what you hear on the episodes. It’s typically a one page pdf that gives you the bullet points of what we discussed. So you can print them out and take them with you when you come to France. To request to get the email extras, go to https://joinusinfrance.com. And there will be a pop up or you can just, um, on the side there’s a little green button. And if you don’t want to get the extras, please unsubscribe because I really don’t want to be emailing people who don’t want this stuff. So I don’t feel bad when people unsubscribe. If they don’t want it, I don’t want to send it to them! Annie: 51:36 On the show next week it will be an episode with Claire Armstrong about moving to France. She makes it sound really easy and she explained all the steps she had to take and how it worked. I don’t know if it was that she was super prepared or if things just got easier with time, but she makes it sound totally doable. You’ll see. Annie: 51:59 The best way to connect with me is via email annie@joinusinfrance.com, or if you have a question you’d like answered on the show, leave a message on 1-801-806-1015. 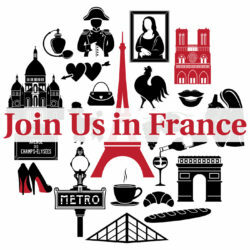 You can also join the awesome Join us in France Closed Group on Facebook where lots of knowledgeable folks hang out and exchange France trip advice without any strings attached. Au revoir, have a great week of trip planning! Annie: 52:30 The Join Us in France travel podcasts is written and produced by Annie Sargent and copyright 2017 by addicted to France. It is released under creative Commons attribution, non-commercial, no derivatives license.